Now that the regional building feature so far has been finished (I also did two more buildings since the last posting, both for research) I went on to implement the next feature, this time it’s research. I already told you that discovering new technologies would be a part of the game, though it won’t be as complex like e.g. 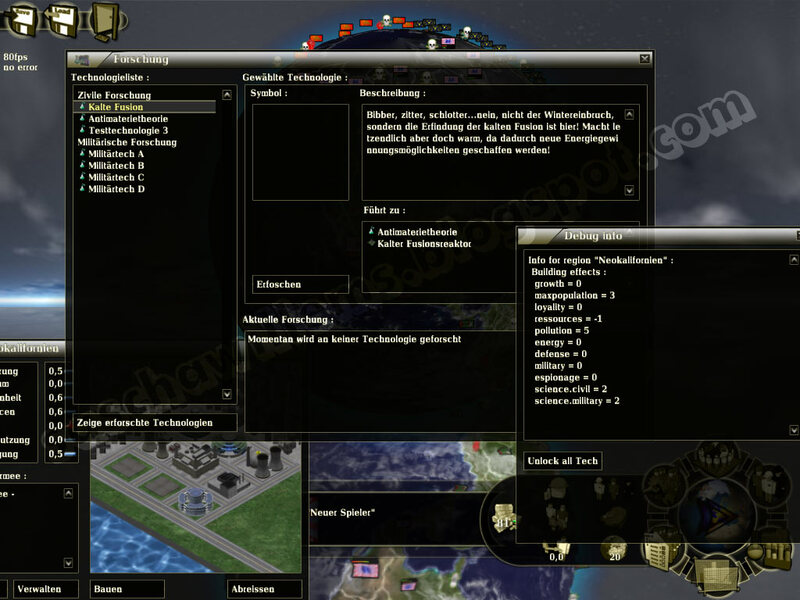 the technology tree in the Civilization series of game, but a lot more simple. For now it’ll only have two different categories : civil and military technologies, which are influenced by your global research factors in those both fields. Each technology will lead to e.g. unlocking new buildings or unlocking other technologies. And for endgame content there’ll also be some technologies that you can research forever which then have some certain effects on global factors or you regions (I’m not totally decided on this), so that research won’t be something you’ll stop caring about half-way through the game. Though I’m still coding on this feature it’s basically working and mainly missing some visual stuff like a nice symbol for selected technologies and stuff. But you can already use research to unlock some of the buildings, so this feature shouldn’t take too much time to finish in terms of coding (though doing content for research is something totally different). And I also added a window for debugging values and to do some “cheating”, which in the end is there to help me debug stuff. And no, this won’t be in the final version.